Travel to a new place relaxes the mind of a person. Italy has miles of coastline and naturally miles of beach. 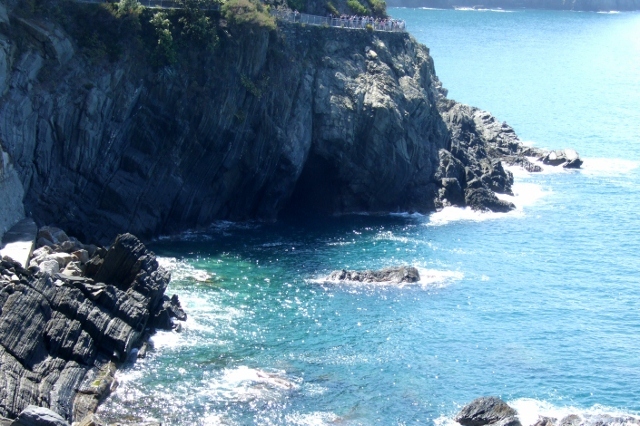 Not all coastline in Italy is amenable to a beach because some is more amenable to harbors or jagged cliffs. I had the good fortune to be able to enjoy some of the best beaches in northern Italy and they were in San Remo, Levanto, and Rimini. San Remo is in the northwestern area of Italy, in an area considered to be the Italian Riviera. 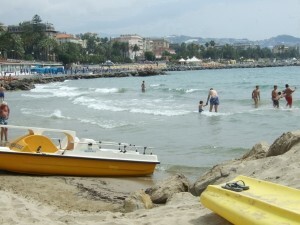 Very near to France, San Remo has a temperate climate and wonderful beaches. In the month of June the Mediterranean Sea was warm enough for me to swim there. 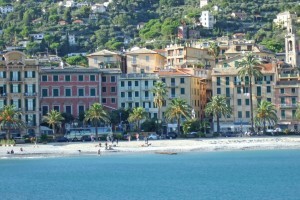 Known as a resort city, San Remo has wonderful beaches and hotels, and many of the hotels have private beaches. Use of these beaches, which are called lido, usually is included with the price of a hotel reservation. This typically includes two lounge chairs and a beach umbrella, and sometimes a cabana as well. A public beach area is always available in addition to the private beaches. Levanto is a family friendly town which makes a good base for visiting the Cinque Terre in Liguria. The train runs through Levanto and it makes for easy access, while not as expensive as staying within the Cinque Terre villages. The beach at Levanto is great not only for swimmers but for surfers as well. Its length is a plus and the sand at Levanto is not full of stones. 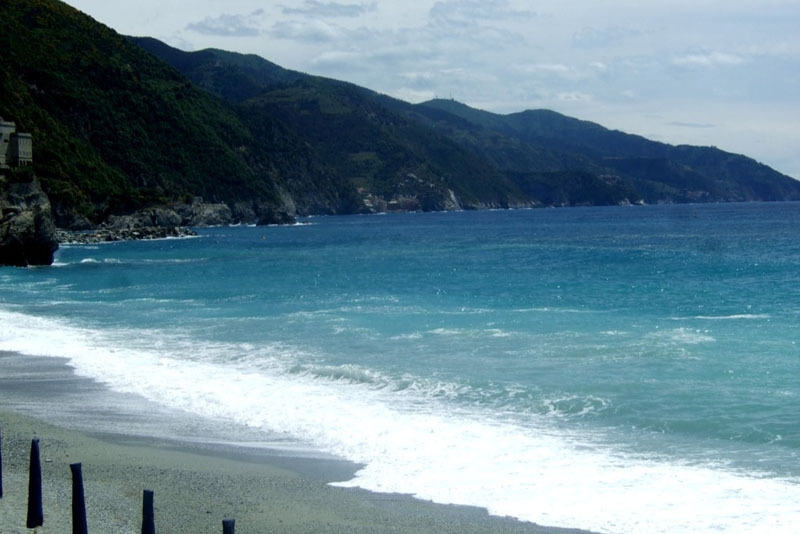 The clean water and the giant waves make Levanto a favorite for surfers. Recently a world surfing championship was held in the waters of Levanto. I found the crescent shape of the beach to be a perfect spot for sunset photos, and I enjoyed watching the surfers as they rode the waves in to shore. I visited this beach just before the summer season began, so things were fairly quiet. In season the beach is filled with chairs and umbrellas as sunbathers soak up the hot sun. Above the beach is a promenade and shops and restaurants are easily accessible. 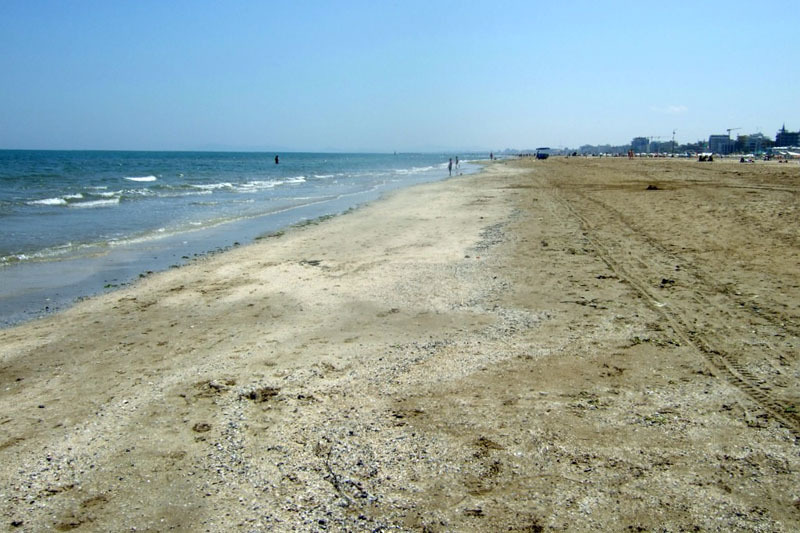 Rimini has long been considered one of Italy's favorite beaches. In the summer months it is also one of the most crowded. Rimini is located on Italy's eastern coast, and its beaches sit on the Adriatic Sea. Because of its nine miles of sandy beaches, Rimini attracts Italians and European travelers all summer. When I spent an afternoon on the lovely beaches of Rimini, I spent four euros for a beach chair and an umbrella. I felt like I had died and gone to heaven. Italy has many other beaches, some smaller and some larger. These are just a few of the beaches in the northern part of Italy. A day at an Italian beach was the perfect reprieve for me after walking around in the hot sun exploring ancient ruins and architecture. The beautiful Cinque Terre on northern Italy’s Ligurian coast draws hikers from all around as there are several walks connecting all the five villages on trails high above the sea. 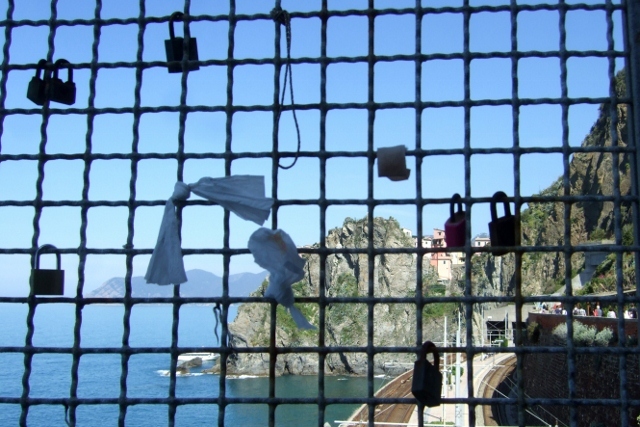 Many of these trails have been closed due to the devastating flooding and mudslides from October 25, 2011 but a couple of the paths are open and the easiest of these is the Via dell’Amore from Riomaggiore to Manarola. 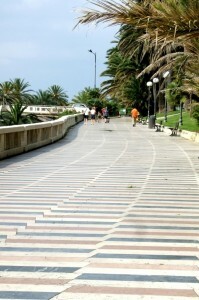 This two kilometer walk is more of a stroll than a hike and the seaside promenade is not that far above the sea. It only takes twenty to thirty minutes depending on how long you want to stop and enjoy the beauty of the rugged coastline and shoot some beautiful photos. Along the walkway are benches made of stone and they make great spots for romantic photos. Even though the Via dell’Amore translates to Lover’s Walk, there are families and people of all ages and situations walking here. Anyone can do this walk and it does not require hiking boots or walking sticks like I have seen on the serious hikers who are here to do the more strenuous trails. 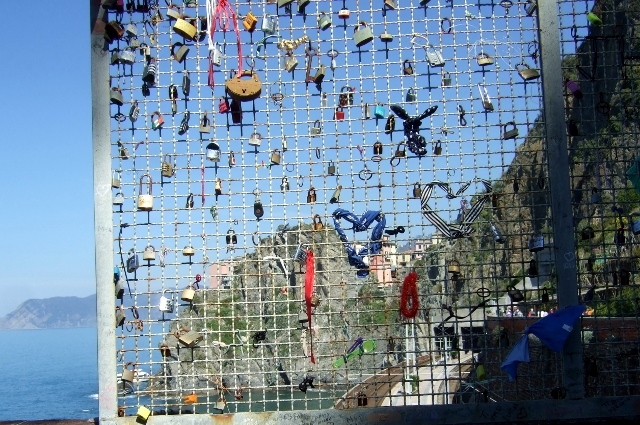 What is so interesting and eye-catching here are the hundreds of locks all along the Via dell’Amore with initials of lovers who have placed them along walls, netting, screening, railings, posts and anywhere they can find a place to affix these locks of love. While walking along this gorgeous stretch of the Cinque Terre I felt very happy and it seemed that was a shared feeling among the others walking along, based on their expressions. How can anyone be in a place as beautiful as this and not feel happy? Riomaggiore is the most southern of the five villages that make up the Cinque Terre and Manarola is the smallest of the villages. Both of these villages are fun to walk around, browse in the shops and take in the scenery and the views. 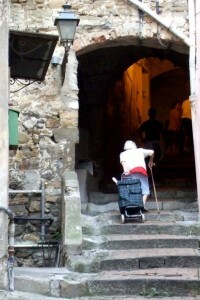 Riomaggiore has the characteristically steep walls and the way around is by steep narrow staircases. The stone houses are painted ion pastel shades, mostly of pink and yellow and there are local ordinances governing the color scheme. Manarola has a beach area that is more or less a swimming hole, and in the summer it is a popular spot for swimming and tanning. Manarola is one of the quieter villages of the Cinque Terre and also has the typical narrow sloped walkways and little shops and restaurants interspersed throughout. 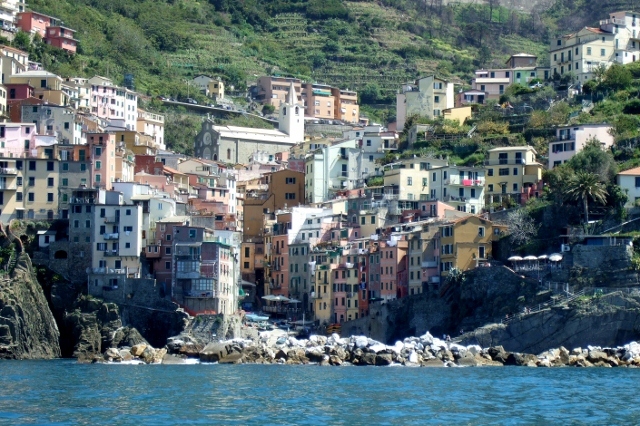 By taking a walk on the Via dell’Amore you can also enjoy these two Cinque Terre villages at a leisurely pace. There is nowhere else quite like this part of Italy. The San Remo Casino was built in 1905 in the Art-Nouveau style and centrally located in the city center. Gambling tournaments, Miss Italia competitions and performances by the local symphony orchestra have taken place here, drawing hundreds of thousands of visitors to San Remo. The casino is a popular venue for gambling as well as culture. The Casino San Remo has served as the entertainment center for the Italian Riviera for over one hundred years, first opening its doors in 1905. The 1951Miss Italia and more recently the European Poker Tournament was held here in October 2011. Designed by the Parisian architect Eugene Ferret, the San Remo Casino takes up the entire city block in the center of San Remo with its grandiose Art Nouveau and Baroque style. Some of the most people in the world have graced the halls of the San Remo Casino, including kings, actors, famous singers and other VIP’s. With 27,000 square feet of casino space, the San Remo Casino is quite a bit smaller than its American counterparts in Las Vegas, such as the Monte Carlo which has three times as much floor space. This makes for a much more intimate gambling experience and the slots machines are for the most part separated from the table games. Featuring 470 slot machines which are located in what is known as the Slot Machine Hall, the San Remo Casino also has five other rooms where you will find French and American table games at five euro minimum bets. The San Remo Casino is well known in the European poker community for hosting world poker tournament events. A sixth private room for high rollers features 500 euro minimum tables in a private and refined setting. Unlike American casinos the San Remo Casino is only free during the week and charges an entrance fee of 7.0 euros on weekends and holidays. So not only can you look forward to losing your money playing the slots or table games, but you are paying for the privilege! Housed within the San Remo Casino is the San Remo Opera Theatre which is the home of the renowned San Remo Symphony Orchestra. The orchestra has been conducting performances on a regular basis for many years, drawing crowds from all over Europe. With a philosophy of encouraging and developing young talent, the music includes not only classical pieces abut also romantic and contemporary repertoires. Many famous conductors and soloists have performed with the San Remo Symphony, and the symphony orchestra has recorded five CD’s and has also been broadcast on RAI media. The San Remo Casino is very important to the city of San Remo as well as a fun place to visit. If you are a gambler, a music lover or just want to admire the Art Nouveau architecture, don’t miss the San Remo Casino on your next visit to Italy! Surrounded by hills and the Ligurian Sea, Santa Margherita lays claim to some of the most beautiful views in Italy. Approaching this port from the sea as I did, I felt like I was looking at a postcard. Seeing the marina to the left and the long pebble beach with the colorful houses and buildings along the shore was a magnificent panorama. One of the other fascinating things in Santa Margherita is the huge statue of Christopher Columbus on the waterfront near the harbor. Although he was born in Genoa, there are stories attesting to the fact that he lived some of his early years in Santa Margherita. 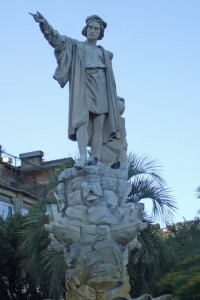 This monument was created by the Italian sculptor Tabacchi in 1892. Since the 17 th century this seaside resort town became a favorite summer residence for vacationing Italians from Genoa which is less than 15 miles away. Since I was not in Santa Margherita in the morning, I didn’t get to visit the famous fish market on Lungomare Marconi to watch the fishermen haul in their catches of the local red prawns. These are found in many of the regional dishes and some of the best and freshest anywhere. One of Italy’s small towns above the hills of San Remo is not particularly known as a tourist destination and that is one of the reasons I liked Dolceacqua so much. Sitting high on a hilltop, Dolceacqua was a sight to behold when I first saw it from a distance. I could make out the outline of the remnants of a castle rising high above anything else, and of course I had to stop the car to take some photos from that vantage point. Located in northern Italy in the region of Liguria Dolceacqua sits high in the hills above the seaside resort city of San Remo near the French border. Less than 1000 families call Dolceacqua home and the ones I met while I was there could not have been friendlier, even happily posing for photos when asked. Surrounding the town are lush green terraced vineyards which produce the popular Dolceacqua wines, the specialty being Rossesse di Dolceacqua, a dry red wine. 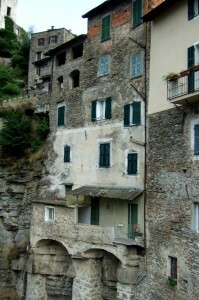 Two of the most interesting landmarks in Dolceacqua are the Doria castle and the Dolceacqua Bridge. The Doria castle which was built in the 11th century belonged to the Doria family for 300 years beginning with the year 1270 when the Genoa captain Oberto Doria purchased the property. Throughout the years the castle sustained much damage through invasions and natural disasters. 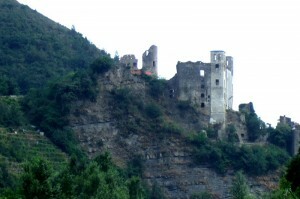 In the 15th century the castle was attacked and damaged by a neighboring king, and the following century it was destroyed during the Austrian occupation. In 1887 a massive earthquake in Liguria badly damaged the castle. Recently restored the castle now belongs to the town of Dolceacqua and some areas of the castle are currently used for wedding receptions and other events. The town makes use of a conference room where art workshops and exhibits are held. A projection room screens movies to educate the public on the cultural aspects of castles. One of the most celebrated bridges in Italy is the Dolceacqua Bridge and the reason for its fame is the fact that it was the subject of a famous painting by the French impressionist, Monet. He painted Bridge at Dolceacqua in 1884 and the original painting is at the Sterling & Francine Clark Institute in Williamstown, Massachusetts. 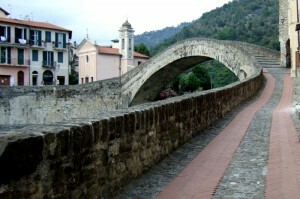 The Dolceacqua Bridge spans the Nervia River connecting the old town called Terra to the newer more modern part of Dolceacqua. The bridge had been rebuilt on what had remained of a bridge which had collapsed in the 15th century. The bridge is 33 meters (a little over 36 yards) long and the winding cobblestoned walkway to reach it lends itself to a very impressive view. Naturally I saw this as a great photo opportunity and although I am not a painter I could appreciate why Monet chose this as the subject of his painting. Portofino is what post cards are made of. The view of the marina and harbor with all the pastel colored painted houses is so beautiful it could be a painting. The semicircular harbor is surrounded by outdoor cafes, restaurants, gelaterie, shops, art galleries and luxury hotels. 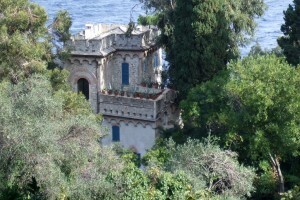 There is even a castle to complete the fairy tale appearance of Portofino. I don’t think I could take enough photos of this alluring scene the first time I saw it. This tiny Italian village on the Ligurian Sea has a population is barely over 500 and is one of the most popular international tourist destinations. 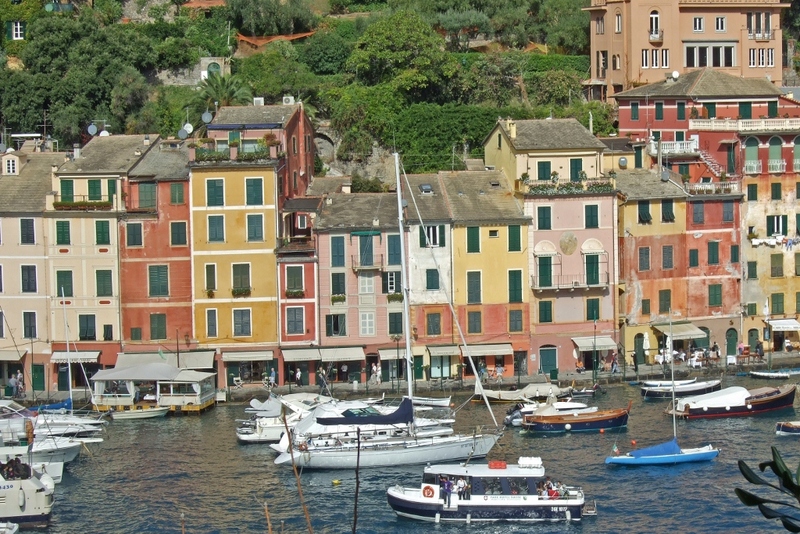 Portofino was once a simple fishing village and now its main industry is tourism and has been for over 60 years. 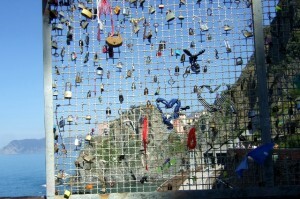 You can walk everywhere here and since Portofino does not allow cars there really is not any other option. Since 1961 Castle Brown has belonged to the town of Portofino. It was built in the 16 th century to serve as a fortress to protect the entrance to the harbor and town of Portofino. In those days its name was St George Castle and when Sir Montague Yeats Brown purchased the property in the 19 th century the name was changed to Castle Brown. To reach the castle you have to walk about ten minutes uphill but it is totally worth it for the fantastic views from that vantage point. Inside the castle as a museum which is open to the public for a nominal fee. The banquet hall inside the castle also serves as a popular venue for weddings and receptions. Portofino is the perfect place to relax and experience “il dolce far niente” or the sweetness of doing nothing, one of the most favorite sayings and philosophies of the Italian people. Other than strolling through the town, shopping for that special piece of art of jewelry, taking a walk to the lighthouse or visiting Castle Brown, there isn’t much else to do in Portofino. That’s where all those outdoor trattorias and cafes can be appreciated. I sat outside at a table near the harbor enjoying a bowl of gelato and a cappuccino, taking in the ambience of this wonderful culture and lifestyle. I could have sat there forever if I didn’t have to board a cruise ship later that day. 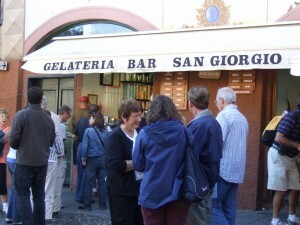 So make time to sit outside and have a cup of gelato or a glass of vino but prepare to pay up to 15 euros for each. There is no other place that captures beauty as Portofino does so enjoy. 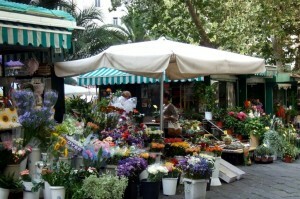 Known as the City of Flowers, or la Cittá dei Fiori, San Remo is one of the most popular seaside resort towns in Italy. 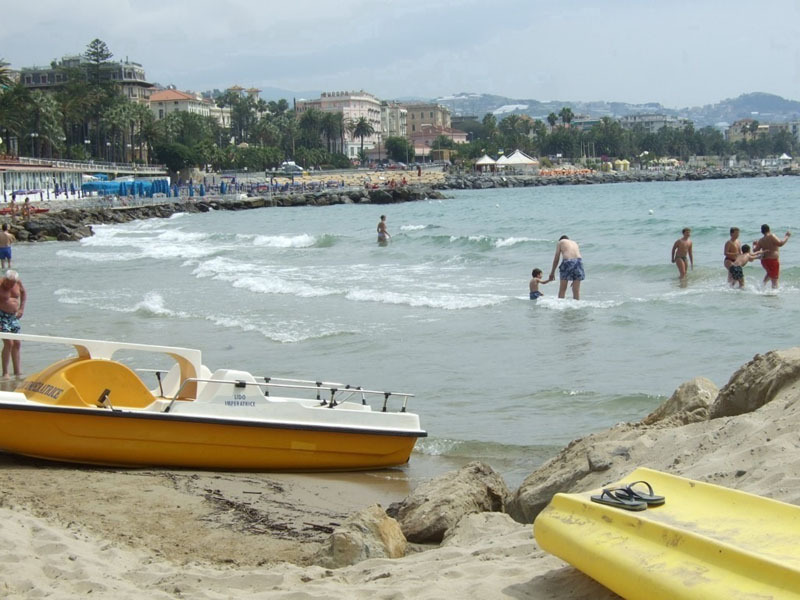 Located on the northern Italian Mediterranean coast in the region of Liguria, San Remo is a beach lover’s paradise. The temperate climate and beautiful coastline draw millions of tourists here every year. Besides its beautiful beaches and boardwalk, San Remo is the home of the San Remo Music Festival, the annual flower festival, the Milan San Remo Bicycle Race and the world famous Casino Municipale. 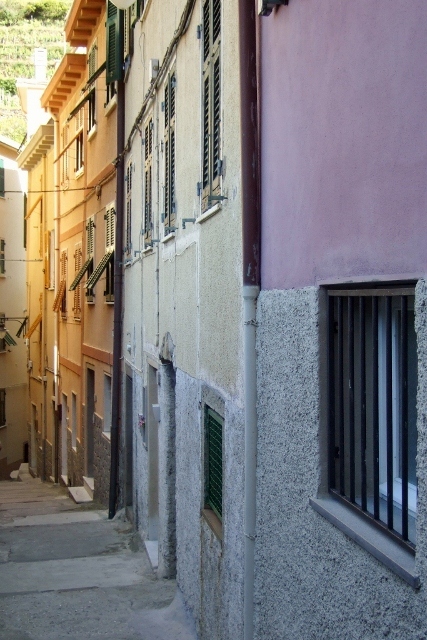 San Remo’s historic old town, called La Pigna, is also a draw especially for architectural and history buffs. The beautiful blue waters of the Mediterranean beckon visitors to San Remo’s famous beaches and many of them have accompanying restaurants and bars, along with cabanas and changing rooms for a price. A lot of San Remo’s waterfront hotels have arrangements with different beach areas and access is included for hotel guests at no fee. There are also some public access areas as well. High above the sand and surf is a beautifully designed boardwalk, making for romantic evening strolls or just enjoyable daytime walks. Along this multi-colored boardwalk made of marble, at one point is the famous Primavera statue, which is a sculpture of a beautiful girl facing the sun with outstretched arms. All colors of flowers are planted at the base of her and you can just feel spring in the air at any time of year. I loved walking around the old part of San Remo where the cobblestoned streets and inclined walkways present a surprise around every corner. Called La Pigna, the locals live in old houses built almost on top of one another in small alleyways and very steep streets. I felt like I was walking in a place just as it existed hundreds of years ago. The local people carry on life here taking the steep staircases in stride because this is their way of life and has been for centuries. The oldest music festival in Europe is the Sanremo Music Festival, which occurs annually in February in the Ariston Theater and attracts music lovers from all over Italy as well as other places throughout Europe. The festival celebrated sixty years this year and is a venue for new talent with original compositions to attempt to make it to the celebrity status. 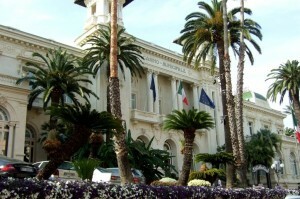 San Remo, with its mild climate in the winter, has earned the name, “the city of flowers” because of all the horticultural growing locations nearby. I could see the greenhouse coverings from above the city in the distance of all around the neighboring towns. So many varieties of flowers bloom very early in the year allowing the San Remo Flower Festival to be held in late January every year. It is broadcast on Italian TV throughout Italy with processions and floats for all to enjoy. This race is held every spring and is the longest one day pro cycling race, at 298 km or 185 miles. Since 1907 the Milan San Remo Bicycle Race has been held every year with three exceptions due to wars. Avid cycling enthusiasts train for this competitive race not only for the prestige of the win, but also the 20,000 Euro prize money. The race begins in Milan and ends in San Remo, with the top speed achieved as high as 45.8 km an hour, and that record was set by Gianni Bugno in 1990. The Casino San Remo was built in 1905 in the Art-Nouveau style and centrally located in the city center. The casino has a lot of history including hosting the 1951 Miss Italia competition, and more recently the European Poker Tournament was held in October 2011. 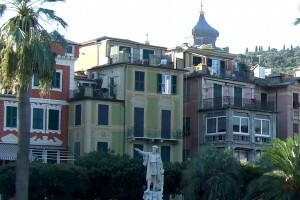 Its grand style takes up an entire city block and is a symbol for San Remo. San Remo is the resort town in the Italian Riviera and offers so much more. I am glad I had a few days to enjoy the town as it is worth more than a day trip. My first glimpse of the small village of Apricale from the road was nothing short of breathtaking, as the town appeared to loom out of nowhere. The homes appeared to have been built on top of one another, and the scene looked like a postcard. Apricale lies in the hills high above the coastal resort town of San Remo, on the Italian Riviera in the region of Liguria. Apricale is a little bit off the beaten track and not populated with too many tourists except in the summer months. Its proximity to the French Riviera and northern Italy make it a popular spot for European tourists. With a population between five and six hundred, the village is a nice change from the more crowded touristy towns like Rome or Florence. The oval-shaped Piazza Vittorio Emanuele II is the heart of the small town and the place where the local residents and visitors come together for all the important events. To reach this piazza, be prepared to walk, as the staircases and narrow steep streets (called caruggi) can only be traversed on foot. Vehicles must park at the lower end of this pedestrian-only town. 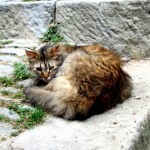 Along the way various breeds of well-fed cats stroll the streets and sit on staircases, and by the numbers of cat bowls on the steps, it is apparent that the local residents have adopted them as honorary Apricale citizens. Some of these cats are friendlier than others. 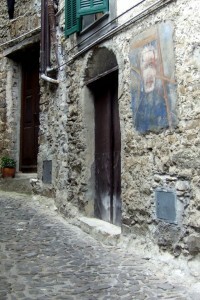 One of the more interesting aspects of Apricale is the hand painted pastel murals and works of art on the walls throughout the town. These paintings are dated from the 1960’s and 1970’s and they depict scenes from countryside and rural living. 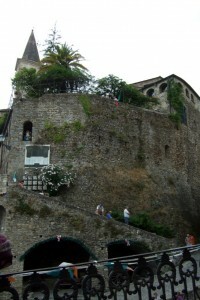 Apricale has a castle, Castello della Lucertola, or Lizard’s Castle. It is actually the remains of a castle although much of it is still intact. Inside there are seven rooms with different themes, and one room is used as a theater museum or gallery, exhibiting figures from designs of the artist Emanuele Luzzati. 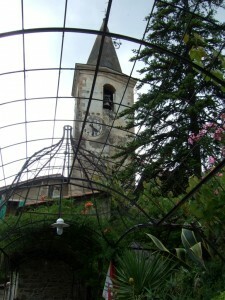 One of the towers that looks like steeple has a bicycle attached to it, left by one of the visiting artists years ago. One of the biggest events is the summer theatre performances which take place in the piazza in August. For the past 20 years, the Teatro della Tosse arrives from Genoa, and there are also performers from the nearby French Riviera town of Nice. July is the month of the finals of the Pallone elastico, or Balu, tournaments, where 16 teams compete in a game which is only played in this area of Italy. An elastic ball is bounced off the walls in the piazza and the players are very serious in this local sport. The winning teams receive trophies which are proudly displayed in the bar in the piazza. September brings the Apricale Festival in the beginning of the month with processions and cooking panserole in the piazza. Panserole are a local treat somewhat like sweet fritters. In January local residents celebrate the New Year around a bonfire, “falo di natale,” which was lit at Christmastime and remains until the feast of the Epiphany on January 6th. If you listen closely to the local Apricalesi, you may hear the dialect being spoken. 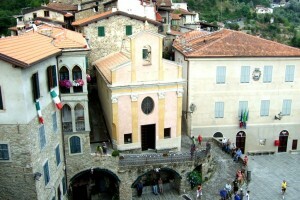 Apricale has a population of less than 600 and is only 75 miles from Genoa. For a change of pace and a town which is off the beaten path, Apricale is a great place to spend a day.